The University of Science and Technology of China paper, authored by Tian Dongdong, Yao Jiawen and Wen Lianxing, said the first of those earthquakes, which occurred 8 ½ minutes after the explosion, was “an onsite collapse toward the nuclear test center,” while those that followed were an “earthquake swarm” in similar locations. The Chinese study makes sense and is based on well understood research, said Rowena Lohman, a seismologist at Cornell University who wasn’t part of the work. She said she believes there’s an international effort that monitors these tests for radiation. 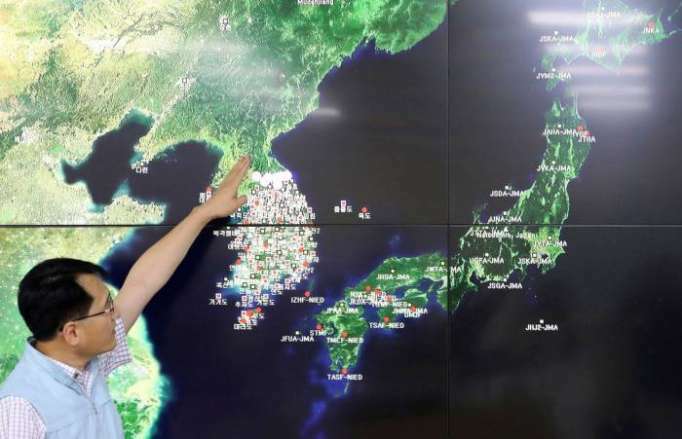 North Korea’s nuclear tests are of special concern to Beijing, since the test site near the town of Kilju is less than 100 kilometers (60 miles) from the border with China. Ties between the sides have been deteriorating for years, although Kim made a long-anticipated visit to Beijing last month after China’s implementation of United Nations economic sanctions reduced trade between them by as much as 90 percent. Kune Yull Suh, a professor of nuclear engineering at Seoul National University, warned last year that further tests could threaten to cause a volcanic eruption at Mount Paektu, which is about 100 kilometers (60 miles) away. On Saturday, North Korea announced it will close its nuclear testing facility and suspend nuclear and intercontinental ballistic missile tests — a move welcomed by Trump as “big progress” — and which comes ahead of the planned summit between him and Kim.